AJ: Ian, welcome to the podcast. Ian: Great, thanks for thinking of me. AJ: Why don�t you tell us a little bit about yourself. Ian: Yeah, I do two things. I�m a professor at Georgia Tech, where I teach in their program in digital media and I do research on video games and culture. And I am also a video game designer and developer. I have a studio called Persuasive Games that focuses primarily on games about political and social issues. AJ: Let�s begin by discussing something interesting you brought up in your First Monday article. Ian, you mention the Pew Research Center�s 2005 Internet and American Life Project which states only 63 percent of U.S. adults have access to the Internet. Can you relate your experiences as being an ordinary person who plays games to the digital divide? What happens to that other 37 percent of adults who are not accessing the Internet? ... any time we talk about using digital media it�s always important to remind ourselves that we�re talking about a privileged class, especially if you think about this on the world stage. Ian: You know that�s a great question because the adults that are not accessing the Internet are maybe not also participating in computational media in general. And any time we talk about using digital media it�s always important to remind ourselves that we�re talking about a privileged class, especially if you think about this on the world stage. And there�s two places you can go with this line of thinking. One, you can apologize profusely for forgetting about essentially all the rest of the world that can�t access these things. Or we can make due and try and understand what it is we�re talking about when we talk about the people that do have access to these kinds of technologies. You know neither one is satisfactory. I think what we�re going to see is an increasing awareness ... the mass media is being continually dismantled, you know we�re seeing all these interesting trends ... user created media, user participation. At the very least more and more people are going to be aware of the wide variety of the different kinds of media that are out there. I mean there are so many divides to talk about. There�s the literal digital divide � the people who are just not online or who don�t have computers at all. Then there are the ones that have them but don�t really use them for all the purposes they could use for. I think there�s a big difference between browsing the Web, using e�mail and playing games, for example. Or making software, editing digital films. And then there are those who are really experts in one area and novices in another. I think in particular this kind of divide between the legitimate media and illegitimate media. Folks who think the computer is viable, software is good, video games, however, are not viable and not interesting as a medium is a kind of media literacy problem we sometimes point to. So you know, what do we do about them? I mean there�s no one answer to this question. It would be nice if everyone in the world could eat and not die of airborne diseases before we start worrying about getting them computers. We don�t want to pretend we�re solving the world�s problems, all the world�s problems, through video games and computers just like we probably don�t think we�re solving all the world�s problems through poetry. But that doesn�t mean they�re illegitimate fields of study or we shouldn�t pay attention to the ways they�re being used by those that do use them. We don�t want to pretend we�re solving the world�s problems, all the world�s problems, through video games and computers just like we probably don�t think we�re solving all the world�s problems through poetry. Joy: You touched a little bit on how video games are not considered a legitimate form of media. Is this what motivated you to write your upcoming book. Ian: Well yeah it was one of the things that motivated me. It�s easy to say video games aren�t considered legitimate, that needs to be changed and it�s another thing to do something about it. So one of the things I wanted to do with the book is provide a set of ideas and tools for thinking about games that would help actually move the needle. So the direction I�ve taken in the book is to suggest one thing that makes media important and legitimate is what they speak about and how they do it. 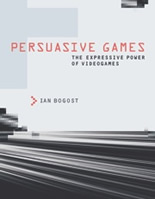 What I�m focusing on in this book is rhetoric or how do games make arguments how do they express opinions about things in the world, which is something we assume all art needs to be able to do. What�s unique about games how do they do that differently than other media such that we would be justified in treating them both in critical practice and just as everyday players differently. So that�s what I was trying to get across in the book and I think all of my work is increasing the range of expression and acceptance around video games. But there�s no point in doing that just for its own sake, rather there has to be something in there that�s actually worth considering. And so to that end I�ve also tried to include a whole lot of readings of games. A wide range of games, from games that are 20, 25 years old to games that are very recent. I think that�s important too, and not to just talk about video games in the abstract sense and how they demand legitimacy and aren�t getting it, but to actually provide evidence that games have been saying interesting things for a long time and to point out how that happens. AJ: Two major points of your First Monday paper are the definitions of �procedural rhetoric� and �procedural expression.� Can you describe these briefly? Ian: Yeah, so this is kind of a core concept to the argument in the book and it�s also a bit complicated. If we think of rhetoric in the classical sense rather than in the popular ways we use rhetoric we use rhetoric these days, if you hear someone on the street use it they usually, you think of a synonym for lies or deceit, and that�s too bad because obviously rhetoric has this long tradition of referring to persuasive speech and can be effective expression. And so the question I�m asking is how do video games speak and express arguments, how do they do that uniquely? And procedurality is a name for the unique properties of computation, a computer�s unique ability to execute a series of rules bound into code, into algorithms. And so my argument is that what procedural rhetoric is a different form of rhetoric, it�s not like speech, it�s not like creating still or moving images, it�s not like writing, it�s a whole different inscriptive mode. We�re writing code, we�re writing behaviors, and those behaviors, those rules are making the arguments. So procedural rhetoric is the kind of rhetoric that makes claims about how things work through processes. It makes claims about how we actually understand the world not through explaining and making claims about how it works, but actually representing how it works through model. And this is a bit of a real change of direction for rhetorical studies as well which is focused primarily on, at least in the last 20 years or so on changes in rhetoric have been focused on images in advertising, in photography, and in films as different kinds of inscriptive practices. So my argument is we need something like that not just for games but for software in general. We have understanding how software makes claims that is different from other kinds of media. Joy: Your article and a chapter from the book focuses on politics. You worked with Howard Dean in the past to create a video game for his 2004 presidential bid. Can you tell us a little bit about the Howard Dean for Iowa game? And secondly has Dean or any of the Democratic presidential hopefuls, Republican or independent candidates approached you about creating another campaign game? Ian: So back in 2003, at the studio we made this game, Howard Dean for Iowa Game. And we did this at the height of the ... kind of �Dean�mania� back before the great fall. And the idea behind the game was that it was suppose to create a kind of interest in so called ______________ supporters, the people who were sympathetic to the campaign but hadn�t yet participated, hadn�t yet contributed. And one of the things we felt there was a lack of concreteness. They were being told things like, �Oh get involved,� but what does that mean? That�s not very informative. We also wanted to explain this whole logic of grassroots outreach that was the cornerstone of Dean�s campaign, was actually a powerful concept, that it could work, and it could work maybe better than large fundraising initiatives like the ones the Republicans were using at the time. So in the game, which is a little simulation of the Iowa caucus. The player starts out with just himself and they sorta go around and start campaigning and performing these little actions and these little mini games that correspond with real campaign activities, like waving signs, and handing out pamphlets, and going door�to�door and canvasing neighborhoods. And as you build support you start to build this grassroots network of other supporters that build support for you and that was the whole concept of the game. And it actually corresponds pretty strongly their entire strategy during the 2004 election. One of things we learned, and I don�t know if they learned but should have learned from that election cycle was that Dean had all these very innovative ideas for campaign strategy but he wasn�t a very strong candidate. And one of the reasons he was talking only about campaign strategy and very little about policy. And cynical though we may be about political campaigning it does seem at least somewhat necessary to start talking about policy and stop talking about campaigning at some point. And we actually saw people when they played the game kinda asking for this. It was almost like a lever in the experience of that campaign where I saw people talking about playing the game and a lot of them realize, �Oh gosh, now I see what you mean by �getting involved,�� but then they ask the question, �Well what does this really have to do with Howard Dean?� Couldn�t I just slap my favorite candidate onto the signs and onto the labels and it would be the same game. And I think that was an interesting wake up call for the campaign that I think we saw through the way these people were playing these games, maybe before the campaign did a month later after the caucus when the whole thing fell apart. So that�s the direction it�s moved in since then, through this idea of procedural rhetoric, making arguments in the simulation itself about how something might or should work or could work in the world. You could think of political games as kinda representing positions on public policy rather than just representations about campaign work. As for this year, the �08 election cycle, it seems that everyone learned all of Dean�s lessons. Every candidate has their own MySpace and blogs and everything like that. This year what the candidates seem to be doing is kind of discovering YouTube and other kinds of Web 2.0 types of content distribution channels. They�ve all got their Facebook pages, and they�ve all got their YouTube videos, and so forth. I don�t think that any of the candidates have really embraced video games any more than I saw them do in the last cycle. But four years ago when I was doing interviews like this, I predicted that in �08 we would see official candidate games on the Playstation 3. AJ: Do you think such games would create smarter voters? So I do believe if we had an everyday connection with public policy issues, maybe games are one way of doing that, we�d be more informed and then we�d make better decisions when we go out and vote. Ian: I think they can create smarter citizens. I mean I do definitely think we have the wool pulled over our eyes and it�s not someone else pulling the wool over our collective eyes. Generally the citizenry has decided, �Well we�re not going to pay attention to politics except every four years, and then we�re going to look at the prettiest face, or the one we recognize the most, or the one that gives us the best verbal rhetoric.� So I do believe if we had an everyday connection with public policy issues, maybe games are one way of doing that, we�d be more informed and then we�d make better decisions when we go out and vote. Joy: Some of these games are tackling serious issues such as social activism, the situation in Darfur, terrorism and the war in Iraq. Is there any research that can speak to the efficacy of video games to get people to actually go out and vote or get involve in these sorts of issues? Ian: Yeah, that�s a big question I get asked that all the time. I�m of several minds on this issue. On the one hand, there are a lot of researchers that are struggling to prove the efficacy of games, especially learning games. And there�s a lot of ways of doing it, and the most common way, especially in the field of learning is that you take the game and some other known form of educational practice. You have a control group and you got you�re experimentation group and you have them take some assessment that would show, �Oh gosh, this happened as a result of a game.� And we�d see the difference between the two groups. That might be one approach. I don�t know if it tells us anything really meaningful in the long term, and I really see human culture operating on a term much longer than the two weeks or three months of a study like that. And I�m less interested in those kinds of quantitative measures, as I am as in the ways people talk about the topics that we represent in games after they play them. So for example, when I went on these Web sites and I watched people discussing Howard Dean�s candidacy after they played the game, they were having different conversations more sophisticated ones, they were asking questions they didn�t ask before. How do those actually lead to their decision�making process in the voting booth, I don�t know if I even care. I�m more concerned that they�ve been sparked to think about ideas in a different way and that�s going to cash itself out over time. Maybe this election, maybe next election, maybe in some other aspect of their lives entirely. Part of this is because I�m a humanist in training, I�m not social scientist, I�m not a hard scientist. I�m less likely to obsess over numerizing the results of my research. But I�m also suggest[ing] our collective obsession with creating numerical outcomes is closing down other kinds of opportunities to think about video games as expressive. We don�t read poetry and then ask people to take assessments of how effective it was in changing their opinions about things. One of the cornerstones of the humanities traditionally is that we study these things not because we know they will be immediately useful, but because we don�t know when they will be. And then when they are, we kind of reflect on our lived lives and our experiences and we use all of the books and films and and art and maybe video games that we�ve experiences as ways of filtering those experiences and making sense of them. There�s certainly not one way of evaluating the efficacy of these games. And I�m content to actually let that play out over pretty long periods of time and see how culture judges us, rather than simply looking at how the numbers at the end of some controlled experiment judges us. Joy: Is there anything we haven�t asked you, that you wish we had? Ian: Oh gosh, there�s so many things to talk about this topic. We�ve been talking a lot about politics and games and games about politics and I�m very interested in those topics. But one of the other things I try and do in my work and in this book Persuasive Games in particular is show there�s actually a lot of sophisticated rhetoric, whether it�s about politics or about health care or about the general issues of being human, in commercial games in general and has been for a long, long time. I guess I just want to highlight that the kind of games I�m talking about in part are new games, or experimental games about these particular issues that we�ve been discussing, but I also think we need to go back to the commercial games we�ve been playing for the last 30 years and kinda look at them and understand them more deeply because there�s registers in which they�re speaking that we haven�t uncovered and taken seriously. AJ: What about a game like Spore? Ian: Everybody�s excited about Spore and Spore�s not out yet so we can�t really talk about it with any certainty. The thing I think is maybe most interesting about Spore that people don�t talk about, is that like some of these other games that I�m talking about in the book, is making claims, is having procedural rhetoric. Spore does this too but it does it very differently I think. We�ve got in Spore a game that is essentially making an argument for this particular mode of astrobiological explanation of life in the universe. The very name �spore� refers to this idea of intelligent life stealing or abducting life from one place and carrying it across the galaxy and dropping it somewhere else and starting new cultures and societies. So if you look at the game as one big, very, very complex argument for that particular perspective of astrobiology that�s what I find most interesting about it. Although all of us are looking forward to messing around with our cells and our creatures and stuff when they finally release it. AJ: Ian, I want to thank you very much for taking this time to answer our questions. Ian: Thanks for having me.